Airplane wreck (second world war) at the old airfield in Adventdalen. Planes used to land in Adventdalen, about 4 km east of Longyearbyen, until the new airport at Hotellneset (the one we know and use today) was built in 1973 and opened in 1975. 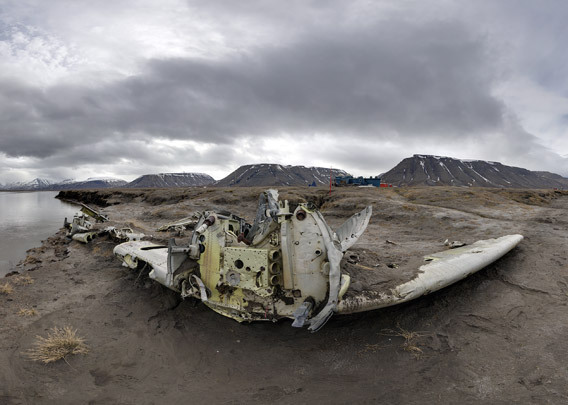 The first landing in Adventdalen was made during the second world war, on September 25, 1941, by a German Ju 52 to land a reconnoissance patrol which should investigate the situation in Longyearbyen, which had recently been evacuated. Soon therafter, the German air force started to establish the weather station Bansö in a Norwegian hut in Adventdalen, between Endalen and Todalen, which was operated over the winter 1941-42. On June 14, 1942, a German Ju 88 from Banak in north Norway landed on the airstrip in Adventdalen, but was damaged because the ground was soft. 12 days later, it was additionally seriously damaged during an attack by an allied Catalina, so it was left behind. Today, the wreck of the German Ju 88 is next to Adventelva (-river), directly behind the building at the old airstrip.